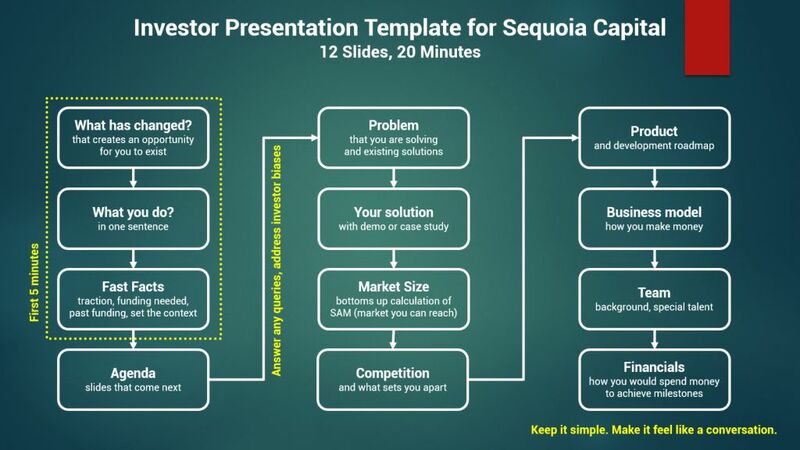 If you are pitching your startup to Sequoia Capital (or any other VC), here is a business plan template you can follow. Sequoia Capital has shared two articles on their website where they talk about how startups should pitch and how a business plan looks like. Here is a template which captures lessons from both the articles. I have added my views and comments below to help you make the most of this template. You only have 20 minutes to pitch, even if you have been allotted one hour. It is better to leave enough time for discussion. Audience interest begins to fall as you start presenting. You have to engage the investor in the first 5 minutes so that you earn the attention for the coming 15. The first 5 minutes is all about setting the context so that the investor understands what you do, how long you have been doing it, how is the business going (traction) and what funding are you seeking. Slide 1 - What has changed in the environment? Have you noticed a trend or do you have a breakthrough technology or product that gives you the scope to start a new business which will potentially become a blockbuster? Slide 2 - What you do? State in one or two sentences what business you are in. Show it to a layman and check whether the understanding is clear. Sequoia's Aaref Hilaly says, "It still surprises me how often we can get 20 minutes into a meeting without a clear picture of exactly what a company does." This is where you give them a snapshot of the overall business. It can be like a timeline. When did you start? Funding so far? No. of employees. Traction numbers. Stages of product development. How much funding are you seeking? Now that the investor has understood your business and is visibly excited, you can put up an Agenda Slide (Slide 4) of what's coming up next. But before you start, pause a little. The investor now knows enough about you to start asking questions in his / her mind. They would have invested in some similar company before. They might have rejected someone who was in the same business. They might have some biases about the industry. No one makes money here? Too much regulation? Scalability is a problem. This is the time to address all of that. Let their mind be free when you start the detailed story (in the next 10 minutes). What problem are you solving and for whom? What are the existing solutions to the problem? According to Aaref, "If you cannot convince an investor there’s something broke, they will not be interested in a solution." Hence, this slide is more important than what comes next. You have to convince the investor about the problem. Show don't tell is the advice. It is better to give a demo, else show screenshots. The best way to 'see' the solution is a demo. You need to calculate the TAM, SAM and SOM (click here for definition). TAM is the Total Available Market for your service / product. This can be given top-down (a figure from Gartner or some big research agency). SAM or the Serviceable Available Market is the portion of TAM that you can reach. SAM figures need to be bottoms up (you need to compute it yourself). SOM or the Serviceable Obtainable Market is the portion of SAM that you can hope to capture. Never claim lack of competition. It is better to reveal all names than letting VCs eventually find out for themselves. Having stated the competitor names, do state what sets you apart. Showcase all your products / services along with a development roadmap. What new features will you add in the coming months to stay clear of any competitor. This is also the place to share how your product actually works and secret sauce (if any). How do you make money? What are the various pricing plans? What would be the average spend by a customer. What is your go to market strategy (how are you going to attract new users?). Names of some large customers (if you are in B2B business). Who are the founders and what is their background. Do they have any special achievements or talent worth talking about. Do mention names of your advisors. Read a detailed post about this slide by clicking here. Aaref advises startups not to lose themselves in the numbers. He suggests keeping things simple. Show your top level revenue and expense statement (P&L). How much money are you seeking and how will you utilize it to achieve specific milestones? These two articles are really useful. Read them by clicking here and here. Do not forget there is one more slide at the start. It should have your company name, a one liner on what you do along with your contact details and company URL. Best wishes for your pitch.